Competition among lessors of office space in Kuala Lumpur is expected to intensify this year, with average rental of office space in the business district projected to remain unchanged at US$24.31 (US$1 = RM3.05) per sq ft a year. Global real estate firm Colliers International said office investment yields are likely to remain stable at between 6 per cent and 6.5 per cent. It said landlords will compete to secure tenants as vacancy rate is set to rise this year. "Despite the improvement on the nett take-up, average vacancy rate is expected to increase towards the end of 2011," Colliers said in its Asia Pacific Office Market Overview for the fourth quarter 2010. The publication, made available to Business Times, states that the office market in Kuala Lumpur will see an increase in fresh supply in the second half of 2011. However, it said if completion schedules are deferred, prime office rentals are set to stay firm over the near term. 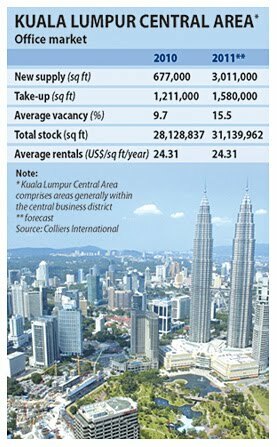 According to Colliers, over three million sq ft of new supply of office space in Kuala Lumpur business district is expected this year compared with 677,000 sq ft new office space last year. This brings the total stock of office space in the area to 31.1 million sq ft compared with 28.1 million sq ft in 2010. The take-up rate is likely to rise to 1.6 million sq ft, up from 1.2 million sq ft last year. Colliers said the average vacancy is set to widen by nearly two-thirds to 15.5 per cent, from 9.7 per cent last year. "One of the latest market trends is that tenants are increasingly focusing on 'green' office buildings for their present needs," it said. In neighbouring countries, the supply of new office space in the central business district of Singapore, Bangkok and Ho Chi Minh City is also expected to rise this year. In Jakarta, the new office supply in its central business district is likely to drop, while there is no new supply in Manila's Makati. While the average rental space in Kuala Lumpur is projected to be stagnant, the rental in the neighbouring countries is anticipated to increase. In Singapore, the average rental of office space is set to grow from US$73.69 to US$88.85 per sq ft a year. Similarly, in Bangkok, the rate is projected to rise to US$25.14 from US$24.37 per sq ft a year. In Jakarta, the rate is expected to grow to US$20.20 from US$19.28 per sq ft a year, while in Makati, it is projected to rise to US$19.33 from US$16.89 per sq ft a year. However, in Ho Chi Minh City, the rate is projected to fall to US$41.20 from US$46.82 per sq ft a year. On the regional outlook, Colliers said the office market in Asia Pacific will continue its recovery in anticipation of a further pick-up in demand this year. "Despite the challenge of forthcoming supply cycles in individual centres, the overall absorption rate is predicted to increase, amid further enhancement of market sentiment largely spilling over from the buoyant asset markets in the region," it said. PETALING JAYA: Property valuers and developers expect the Klang Valley Mass Rapid Transit (MRT) project to have significant impact on the prices of residential and commercial properties along the MRT route. Eric Oii, a member of the board of valuers, appraisers and estate agents said property prices - commercial and residential - along the MRT route could appreciate by 15% to 25% depending on the location of the property to the stations. “We expect generally properties within a 500-metre radius of the MRT stations to have the most appreciation in value,” he told StarBiz yesterday. Oii, who is also managing director of property consultancy firm Knight Frank Ooi said MRT linked to a network of lines integrated with the LRT, monorail, KTM Komuter and intra-intercity buses city would help ease traffic congestion and cut the cost of travelling. However, Oii said in the short term, especially when the MRT was being built, it might cause inconvenience to some people especially those living or working close to the stations. “The impact of building the MRT is expected to be more physiological to the community,” he said, adding that any major structural developments were expected to impact a certain group of individuals negatively. There was an outcry by some residents in some suburbs (where the MRT stations are earmarked to be built) including those in Taman Tun Dr Ismail, who had criticised the development, claiming that the MRT station would cause traffic congestion, and possibly lower the value of their properties. Ho Chin Soon Research Sdn Bhd director Ho Chin Soon concurred with Oii that there would be some disgruntled individuals who opposed the MRT project but in the long run it would benefit the majority of people, especially the lower income group that depended on public transport. Ho Chin Soon Research is a local mapping and property research based company. Based on the company's compilation of data on MRT stations in various countries, it can be concluded that they would help raise property prices. “Properties close to the MRT stations can expect better appreciation once the station is built. And those very close to the station are likely to benefit also. In certain circumstances, some properties very close to the station may be impacted too resulting in a fall in prices,” he said, adding that such cases would be an exception rather than a rule. Ho also said it would be reasonable to conclude that properties around a 500-meter radius to a MRT station would appreciate value once the station was built. “Those within walking distance would still appreciate from its proximity to the station. Our tropical climate makes it not very conducive to walk longer than 10 minutes to a station,” he noted. Ho also said a 15% to 25% upside in property prices (depending on locations) was be a reasonable level of appreciation for properties close to the MRT route, especially to the stations. “We can also expect the MRT integration with other trasports lines like the LRT to further enhance the property prices of those especially in the Kuala Lumpur Golden Triangle as it would improve inner city connectivity. An established property developer said many developers were looking to strategically build properties. especially condominiums close to the MRT stations. “We want our property projects to be located within walking distance from a MRT station as we believe it would be a a major factor to potential home buyers. It is also easier to rent a property that is close to a station. All these factors should help boost the property value,” said the developer. Information on the first stretch of the MRT route that connects Sungai Buloh to Kajang is available to the public at six designated location from Feb 14 to May 14. They are Dewan Bandaraya Kuala Lumpur, Bangsar LRT Station, Majlis Bandaraya Petaling Jaya, Majlis Bandaraya Shah Alam, Majlis Perbandaran Kajang, Majlis Perbandaran Selayang and Suruhanjaya Pengangkutan Awam Darat. The Sungai Buloh to Kajang MRT line is a 51km, of which 9.5km is underground. The line will have 35 stations and is expected to have a ridership of over 400,000 passengers per day when completed. Work on the line is targeted to commence in July and is expected to be completed in 2016. KUCHING: Naim Holdings Bhd, which is focusing on building more affordable houses, targets to sell 850 properties this year. Corporate services and human resource senior director Ricky Kho said as houses below RM200,000 were in strong demand, the company would launch more such properties, particularly at its flagship satellite township Bandar Baru Permyjaya in Miri. Naim, Sarawak's largest property developer, has built about 12,500 houses and other properties in Permyjaya. “We sold about 480 houses worth RM150mil last year compared with 530 units valued at RM152mil in 2009. “Houses of higher value were sold in 2010,'' Kho told StarBiz. He said about 65% of the houses sold last year were in Permyjaya. Naim's other property developments are Desa Ilmu and the Riveria in Samarahan. 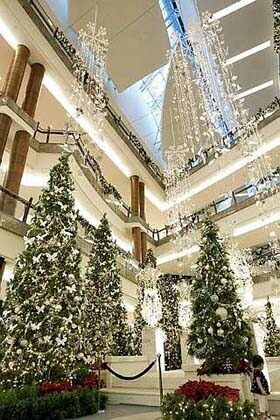 Kho said the construction of RM60mil Permy Mall in Permyjaya was progressing well and the mall was expected to open its door before Christmas this year. The mall will house a hypermarket, 160 retail shops, a food court and other facilities to serve the increasing population in the township. Naim has a landbank of some 1,050ha in Miri, Kuching and industrial town Bintulu which has a combined gross development value (GDV) of some RM6bil when fully developed. Naim recently entered into a joint venture (JV) with Cahya Mata Sarawak Bhd (CMSB) and Bintulu Development Authority (BDA) to develop Samalaju township in Bintulu. The JV company, Samalaju Property Development, is now constructing temporary camp facilities for construction workers of industries in the Samalaju Industrial Park within the Sarawak Corridor of Renewable Energy (SCORE). The first industry in the park is Japan's Tokuyama Corp, which is expected to start the construction of a poly-silicon plant next month. On Naim's proposed extension of its property development activities to Sabah, Kho said the company had set up an office in Kota Kinabalu. "We have identified several properties for acquisition or joint venture in Sabah but nothing has been finalised," he added.